The Transfer to Degree Guarantee helps career and technical students transfer credits to community college or four-year degree programs. 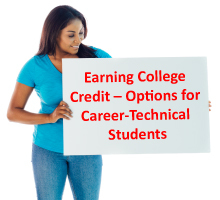 Click here to find out more about how Ohio career-technical students can earn college credit. Use our simple four-step process to see if your credits transfer. In order to view the applicable credit hours for your Career-Technical courses, check out the "Just the Facts" PDF available on this page. Step 1 What was your program? Step 2 What school district did you attend? Step 4 When did you take the program? Step 4 What college will you attend?